Saudi Arabia is a quadrilateral land mass, occupying a major part of the Arabian Peninsula. It covers an area of about 2,250,000 sq. km. The vast landscape is composed of a variety of habitats such as mountains, Valleys (Wadis), sandy and rocky deserts, meadows (Raudhahs), salt pans (Sabkhahs) and lava areas (Harrats), etc. In a broad geographical sense, Saudi Arabia can be divided into two distinct zones; the rain fed highlands of the western and southwestern regions (Sarawat Mountains) and the vast arid and extra arid lands of the interior (Najd). The Najd area, which occupies the lion share of Saudi Arabia, is located on the eastern side of the entire Sarawat Mountains and adjoining areas. It has a varied and deserted- topography such as vast sand seas, bare plateaus, small mountains, plains, etc. 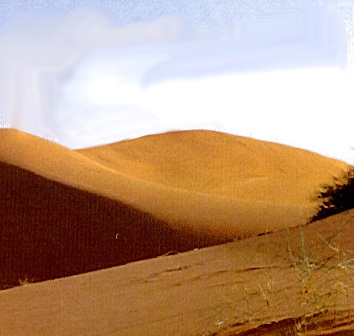 The deserts are composed of Aeolian sands and are more or less continuous with Great Nafud in the north and Rub al-Khali in the south, both of which are connected by an arch shaped Dahna sands. The Central Region in general, is characterized by patchy, gravel deserts, hillocks and wadis whereas northern and north-central regions of the country are an exposed complex of Pre Cambrian igneous and metamorphic rocks. 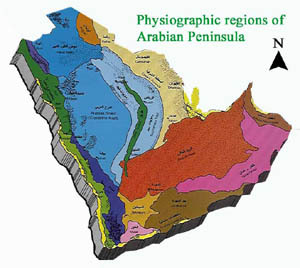 The altitude of the plains in the Central Region is about 500-800 m and the relative height of the mountains and escarpments (Jabal Shammar, Jabal Tuwayq) varies from 300-600 m. The Eastern Region is broadly divided into 1). 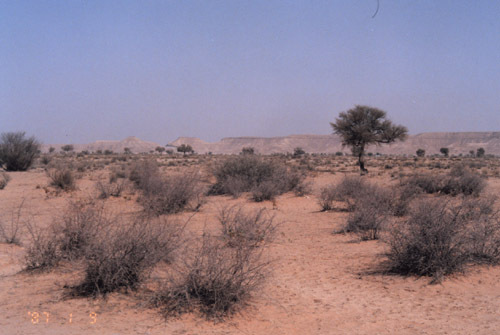 Summan plateau, an open plain adjacent to the Dahna sands, 2). the Northern plains which is bordering with Kuwait, 3). the coastal lowlands and 4).the Rub' al-Khali, the largest, continuous sand body in the world. 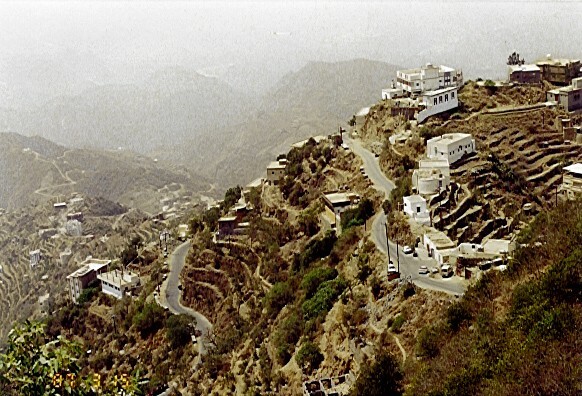 The mountains of southwestern region form a continuous chain of escarpments, extending from Taif to Yemen border. 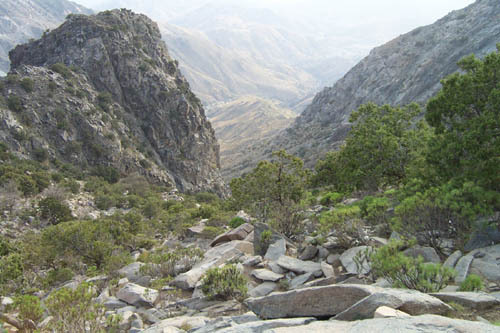 The peaks reach elevations of over 2000 m in the vicinity of Taif and extreme south and over 3000 m in the Abha area. On the western side of the highlands, the mountains fall in a series of dramatic escarpments and finally merge with the Tihama coastal plain while the eastern sides slop more or less gradually towards the interior parts of the country. Mountains on the northwestern sides are generally discontinuous, less rugged and much drier. The east facing slopes decent gradually and end in a high plateau. 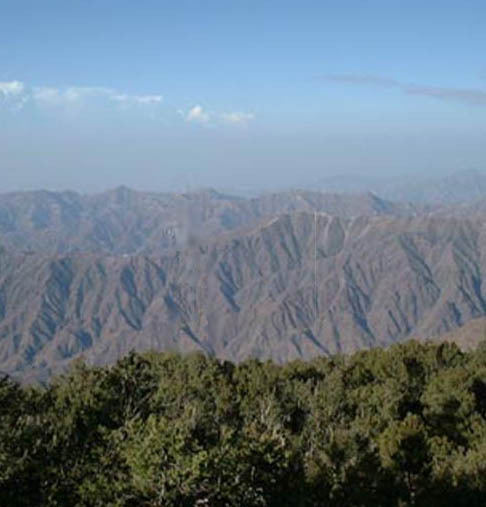 The mountains on the western side, especially the Asir Mountains are characterized by cool climate, high precipitation and high humidity. The landscape of the region holds a variety of plants, most of which have an affinity with the plants of East African countries. 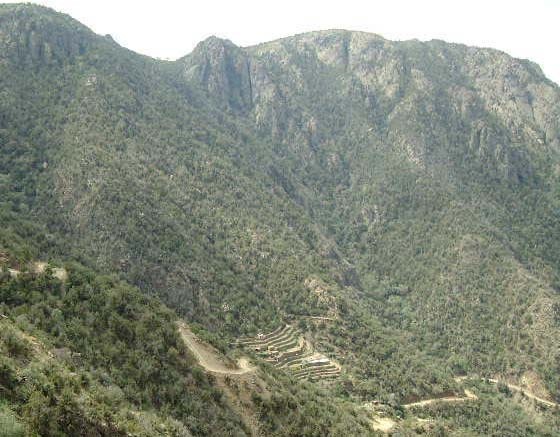 The spectacular beauty and pleasant climate of the Asir Mountains attract many people from the central and eastern parts of the country during summer. 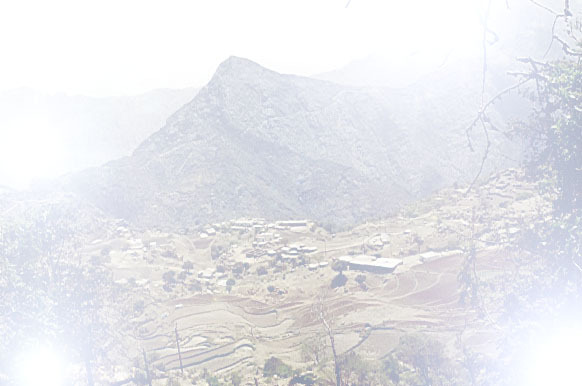 The mountains of Jizan Region, especially the Fayfa Mountains reach a height of about 2000 m. The west facing slopes are steep while its eastern side slopes gently towards the inland plateau. The highest peaks of the mountains are heavily populated with new houses and agriculture lands added every year. Tihama lies between the Red Sea and the Escarpments. It is narrow in the northwestern side and wider in the southwestern side. This is an open plain, generally divided into shoreline, salt pans, plains and wadis. 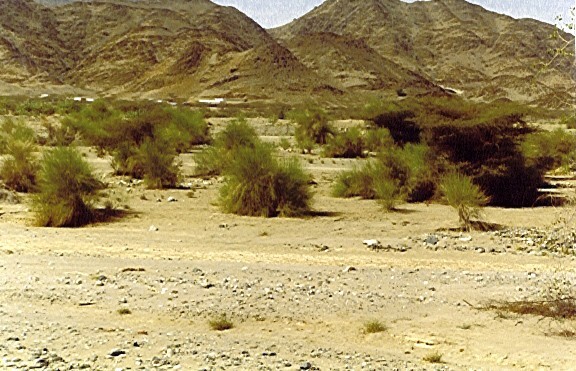 Tihama is dissected by major wadis and their tributaries. During rainy days flash floods often over flows the low banks of the wadis and spill over a wide area. Approximately 30% of the land of Saudi Arabia is covered by three major sand bodies. The Great Nafud, situated in the northern part of the country, is a 60,000 sq km wide area with red stained sands. The Rub al-Khali or the Empty Quarter, with its extreme climate, occupies in 500,000 sq km area and is located in the southern and southeastern part of the country. Some of the sand dunes in this area are as high as 250m. These two deserts are connected by an arch-shaped sand-body called Dahna. It is narrow strip of desert with a width up to 50 km. in some places. It is a natural boundary, separating Eastern Province from the Central Najd Area. Site designed and maintained by Dr.Jacob Thomas, Herbarium (KSU), King Saud University, Riyadh.